Willie Rennie is backing Jo Swinson (pictured) as a potential replacement for Sir Vince Cable (pictured left). Picture credit: Getty Images. Liberal Democrat MP Jo Swinson would be a "fantastic" replacement for Sir Vince Cable when he steps down as UK leader, the head of the Scottish Lib Dems said. Willie Rennie hailed Ms Swinson - who is currently on maternity leave after the birth of her second child - as being an "incredible performer" and a "top quality" politician. He spoke the day after Sir Vince, 75, announced his plans to quit the post after Brexit is "resolved or stopped". 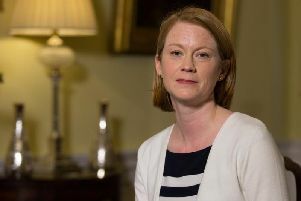 Asked if that could pave the way for Ms Swinson, the current deputy leader, to take over the helm of the party, Mr Rennie said: "She would be fantastic, I think she is a top quality parliamentarian. "She's so professional, an incredible performer and a really intelligent woman. I've got a lot of time for Jo, I think she is fantastic." But he quipped: "If Vince is waiting till Brexit is over he might be there till 2047." Mr Rennie gave his support to proposals from the UK leader to widen participation in the party, which could see voters who are "liberal-minded" allowed to sign up for free under plans to bolster membership. While the Lib Dems have languished in the polls and struggled electorally since going into coalition government with the Conservatives in 2010, Sir Vince said on Friday he wanted to create a "movement of the moderates" that would bring together voters who loosely identify with the party. Mr Rennie, who spoke to journalists at the Scottish Liberal Democrat conference in Dunfermline, Fife, said some of the ideas being put forward were based on reforms that managed to "reform and revive" Liberal parties in both Canada and Germany. And he said he had no concerns about allowing more people to vote for the next party leader. "I'm not worried about that at all," the Lib Dem MSP said. However in his speech to the conference, former Scottish leader Tavish Scott cautioned party chiefs to "be careful with anyone voting for our leader", recalling how Jeremy Corbyn was elected Labour leader after his party allowed non-members a say. But he agreed party reforms were "long overdue" as he made clear the Liberals must offer an alternative to the left-wing politics of Mr Corbyn and the hard Brexit policies espoused by Tory Boris Johnson. While Mr Scott said the Lib Dems needed to fill "the glaring gap in modern politics", he warned if they could not be relevant "then the world will pass us by". Mr Scott said: "We have not set any heather on fire since 2016, despite being the only avowedly pro-European party who should at least get a hearing from 48% of the electorate. "Tony Blair said yesterday that if the British public are offered a choice of Corbyn versus Boris at the next election they will be looking for something else. "He is right. And we need to make that alternative us. That is the glaring gap in modern politics. "This is a time when liberals have been needed by the nation like never before."